River Rise Preserve State Park | Florida Hikes! A passive preserve, River Rise Preserve State Park adjoins O’Leno State Park, taking up where O’Leno leaves off with the Santa Fe River flowing underground. The river emerges all at once at River Rise, a significant geologic feature that bars paddlers from heading any farther upstream. Like other folks who go to High Springs, I’ve driven by the gate for River Rise Preserve State Park on US 27 and never seen it open. Why? You can’t get there from here without having the combination to the gate. It must be obtained after you pay the entrance fee at O’Leno State Park’s ranger station or by calling 386-454-1853 in advance. Cloaked in shady forests of sweetgum, cypress, tupelo, and red maple, the preserve has numerous large ponds where the Santa Fe shows itself for a moment or two through karst windows along the trails. 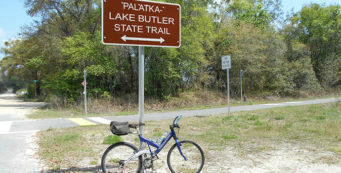 Access 20 miles of equestrian / mountain biking trails and the backpacker’s loop at River Rise via the Bellamy Road entrance of O’Leno, or from the main parking area of O’Leno State Park itself. 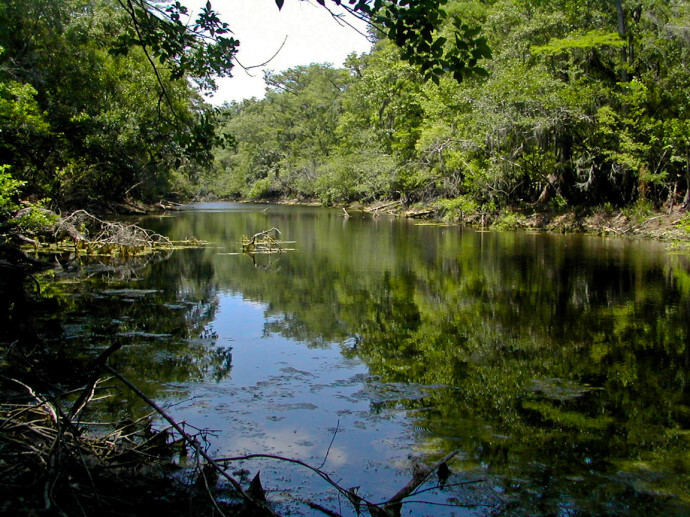 Paddlers can paddle upstream from the put-in along US 441 at the Santa Fe River to the rise. A 20-stall barn, bathhouse, and pavilion await equestrians for primitive camping; reserve your spot through the ranger station at O’Leno (cannot be reserved online).